The Spanish Oviedo arms factory produced rolling block rifles under a patent agreement with Remington. There are a number of key indicators when identifying these rifles. The receivers are typically stamped on the right side with the Crown over ARO over the date of manufacture. 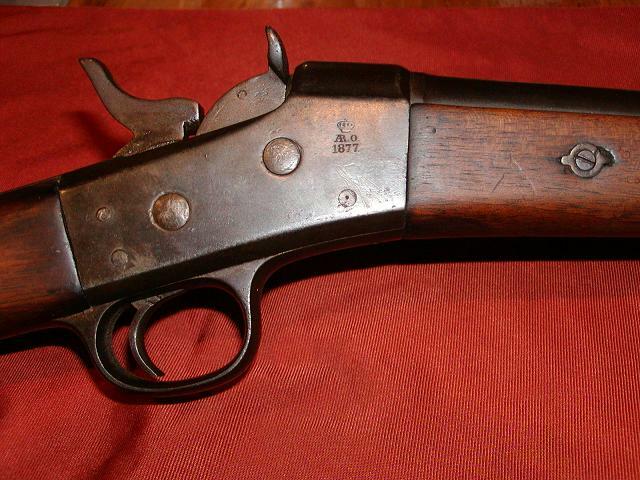 The forend is also attached with a cross bolt just forward of the receiver, (see photo). The rifles were chambered .43 Spanish Reformado, the proprietary national cartridge for the kingdom of Spain. The breech block, hammer, and trigger guard are about .040 inch wider than the Remington counterparts and do not interchange. 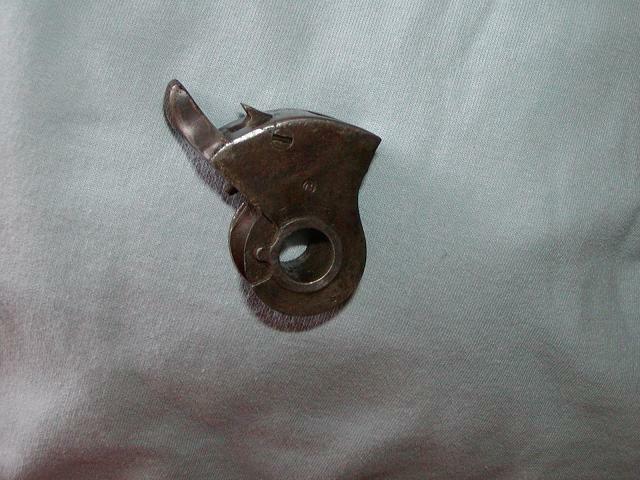 Also note the addition of a firing pin retractor in the top of the breech block. This is similar to the concept used in the Danish Rifles. The straight bar extractor usually has two down legs and the breech blocks show a double notch cut in the left side. The receivers will make a nice custom rifle keeping in mind the original cartridge chamber pressures. The Oviedo receivers & barrels are threaded with a V thread as opposed to the square thread of the Remington. loose with a 12-24 ; Length 1.84 in. Guard Screws - We currently have two receivers, one uses the 11-28 Remington guards screws, the other 12-24s. Also note- some of the trigger guards are threaded on the right side. This will require the guard screw be threaded a longer distance from the end to fit both the guard and the receiver wall, or the right trigger guard hole reamed to accommodate the major diameter of the guard screw. Length 1.37 in. ​Main Spring- The Oviedo main spring is slightly shorter than the Remington, a Remington spring can be fit to the Oviedo by grinding and polishing the tip. The Remington spring is made for a mounting screw no larger than a standard 12-24. Either the hole in the spring needs to be reamed slightly or the mounting screw replaced. ​Main Spring Screw- this is a slightly oversize 12-24. Brownell's 12-24 while a bit loose going in will work for this application. Note- the Remington Main Spring Hole is only large enough for a standard 12-24. Button- Our standard Remington button fits our Oviedo receivers. *NOTE - Parts not listed above may be listed on the Original Parts Page and are subject to availability. NOTE - the above is information obtained from a limited sampling of Oviedo rifles, receivers and individual parts. We have no way to account for the variations created by Gunsmithing modifications over the years. Your particular parts may vary. When ordering the above parts please order by the part description. The part numbers are for illustration only and do not reflect any inventory control number. Shipping for the parts above will be charged as $4 for the first part and an additional .50 for each additional part except where noted otherwise. Copyright © 2012 Kenn Womack. All rights reserved.